Scopri la bellezza di The Great Wall of China in questa giornata di escursioni. 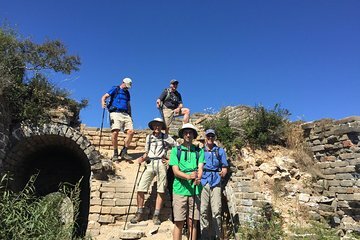 Essendo una delle attrazioni turistiche più famose della Cina, The Great Wall può diventare molto affollata, ma questo tour ti aiuta a evitare la folla andando a una parte meno trafficata del muro: Jiankou. Avrai una giornata senza stress senza la preoccupazione di navigare mentre la tua guida ti verrà a prendere, quindi segui la strada mentre cammini lungo la Grande Muraglia di Jiankou. This was the highlight of our time in Beijing. We wanted to find a rough, less frequently traveled section of The Wall, and Jiankou fit the bill perfectly. Be advised, that this is a rough hike, not a walk. The steepness of certain sections of the wall resulted in almost as much climbing as hiking. It's not terribly strenuous, but you must be sure-footed and able to navigate waist-high steps and rocks. Your knees will take a beating. We saw only four or five other people during our entire time on The Wall. The rest of the time it was just the two of us and our guide, Tony, who was fantastic. He was very knowledgeable about the history of The Wall and spoke the best English of anybody we met in China. The little family restaurant he took us to for lunch was peaceful and relaxing, and the food was excellent. If you want to get away from the crowds and are accustomed to hiking mountain trails, this is the tour to pick. Thanks Tony!